A cake with a logo, in this case the Researchers’ Night logo, is a good way of marketing an event and getting passers-by to stop and look. 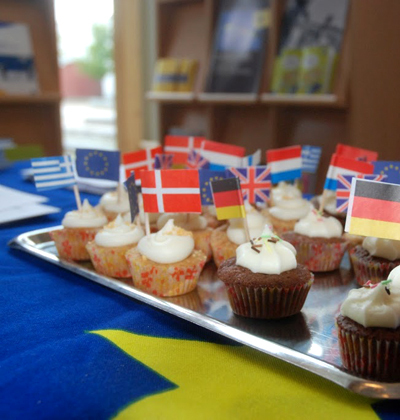 Cakes decorated with flags of EU countries were used during Researchers’ Night events. Visitors were asked to match the cakes with the names of the countries – a fun and somewhat unexpected competition which facilitated an EU-related conversation. Target group: Flexible, particularly suitable for younger visitors. Preparations: Design the cakes and order or bake an appropriate amount. Market the activity. Challenges: Determining the appropriate number of cakes. Benefits: Cakes appeal to a lot of people and give a welcoming and pleasant impression. They can tempt people to approach an information tent or table by acting as an ice breaker and a conversation starter. Different types of information materials.